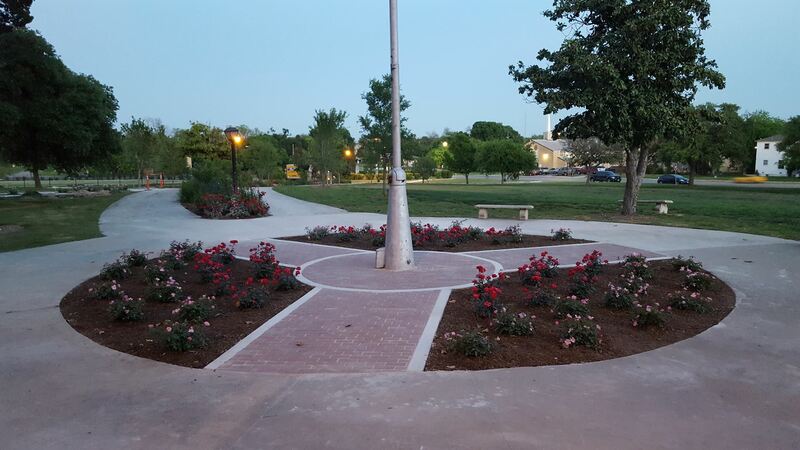 RIGHT: Flagpole showing brick base with landscaping complete. The memory bricks will replace the bricks that are in place now as they are completed. The first batch is read to be scheduled for placement! Purchase a custom, sandblasted message on one of the bricks that make up the base of the flagpole on the Jefferson front lawn.Your message becomes an actual part of Jefferson! In addition to creating a place for you to "immortalize" your message, your money helps fund a major project of the Historical/Preservation Society, restoring the Student Council fountain in the school patio. The bricks cost $75 each. Purchasing and placing a brick is a chance for any Jeffite to honor or memorialize the special people in their lives at Jeff. You can imagine the bricks shown being replace with these "engraved" pavers that will be seen by student for years to come. And what a place to visit when you can make it up to the school. Your own little piece of Jefferson for you to enjoy always. Help the Thomas Jefferson High School Preservation Society continue to carry out its mission to restore and preserve Jefferson by taking part in this effort, which will help fund the restoration the the Student Council Patio Fountain, a rich piece of our Jefferson heritage. Update January 9, 2016: 212 of 1,156 brick purchased. Download the Memory Brick Order Form. For questions regarding the memory brick project, contact David Sims at 210-573-5110 or dssims@aol.com.